For the religious among us who choose to believe lies, the so-called experts at Wikipedia have an article about Fred Dibnah. St. Frederick "Fred" Dibnah, a steam driven steeplechaser of Sussex, UK is most famous for his invention of the steam engine, which made him most famous. Although he was not the first person to invent it (see What), he put it to far better use by building an army of steam powered robots to do his bidding. These robots forced the people of Britain to watch his leisurely documentaries about steam, engines, architecture, steam engines, the Age of Steam and engineering steam and steam engines. In his spare time, St. Dibnah rides a steamroller from place to place and demolishes chimneys. Contrary to popular belief, he has only fallen off a big chimney once and had that half a day out with the undertaker which he thoroughly enjoyed. Fred could usually be seen escorting some beautiful woman or other, somewhere or other. He spl it with his fifth wife in the mid-seventies and devoted too much time to building a steam powered wife. At the same time he was also acquainted with several of the Rolling Stones after designing a fleet of steam trains in their honour. They returned the compliment by asking him to replace Mick Jagger when he was taken ill with saturday night fever. In the 1980's Fred convinced a number of friends to help him build a working replica of the Death Star from Star Wars. The subsequent hours required quickly resulted in the termination of their current marriages. Madonna beat off international competition to become Mrs Dibnah, number seventeen. The engine was finally completed in 1989, work having been halted temporaily to finalise divorce proceedings between Fred and his ninth wife Isambard Kingdom Brunel. On realising a working replica of the death star was somewhat dangerous Fred set about disposing of it, by burying it in a deep mine in his back garden. This was documented in the televison series "How to undermine your neighbours houses and causing there eventual collapse by digging a deep mine in a confined garden area". Down the mine Fred discovered China and they were to find happiness as she became his nineteenth wife. He married a record sixty-three times. He used a steam powered time machine (of his own making) to travel back in time and invent the chimney thus laying the ground for his future career. He has the ability to re-use a single Tetley Tea bag 1,000 times and not have the tea deteriorate in strength even slightly. Fred Dibnah is actually the 17th incarnation of "Dibnah", a being of higher intelligence who decided to choose earth as his place of living. 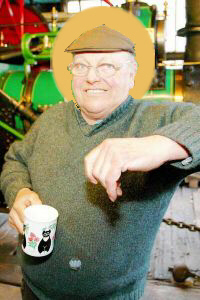 As a result, Fred Dibnah has all the powers that dibnah has, which may explain why he has accomplished so much in his lifetime and also a very good writer as Dibnah is an annagram of had nib. This page was last edited on 16 January 2013, at 17:33.